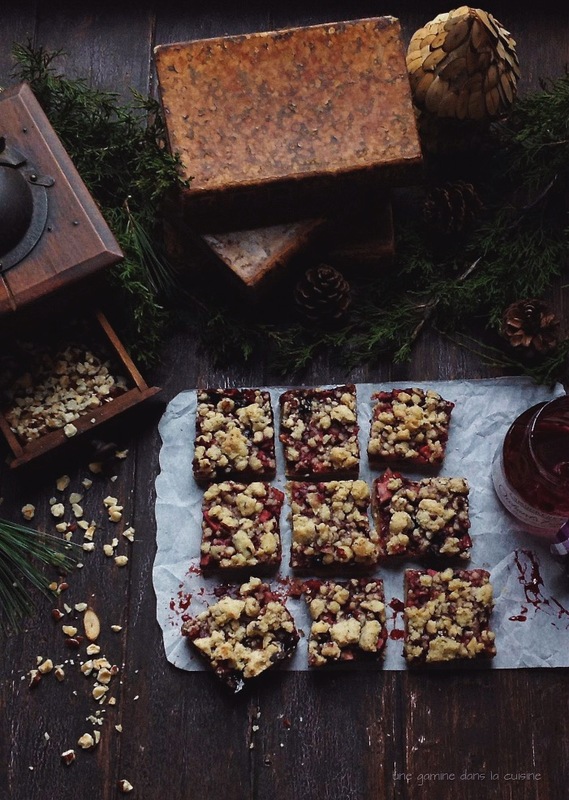 This recipe is a gussied up take on last year's cranberry bars. 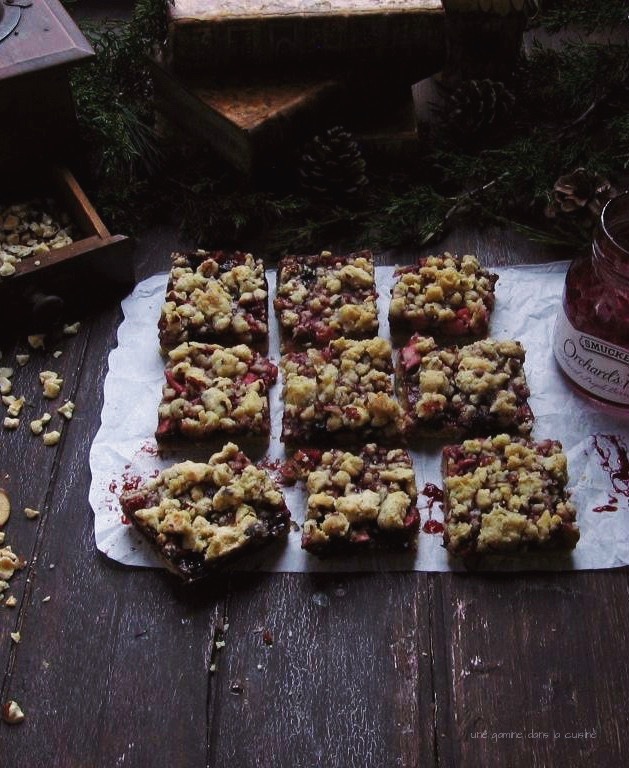 I tossed in toasted hazelnuts + swapped cranberries with apples and berry jam, the results were messy & luscious! There's something a wee bit sultry & almost masculine about toasted hazelnuts, yes? When *slightly* singed, hazelnuts take on a rich, ashy-sweet aftertaste...their smoldering aroma made my kitchen smell like a savoury, winterling pine forest. The bars are simple, aside from chilling the pre-baked crust for about 40 minutes, they don't take long to piece together. Browning the butter adds an extra layer of loveliness to the already bewitching streusel, it's worth the extra step. Feel free to use your favourite jam, or, if you don't have apples, double up on the amount of jam...the recipe is versatile and forgiving. I'm elated to bookend 2014 on a crumbly, sticky, gentle note. Line a 9x13-inch pan with foil, leaving a slight overhang along the edges. Lightly butter the entire foil-lined pan. Prepare the crust: Have a medium heat-proof bowl on hand for the brown butter. In a large bowl, combine the cooled brown butter, 3/4 cup of sugar, and salt. Stir till well blended. Add the yolks and the almond extract, whisk until smooth. Using a large rubber spatula or wooden spoon, stir in the flour until you have a stiff dough. [It will have a very odd, dense texture for shortbread, but it will bake up beautifully, so don't worry.] Transfer about 2 cups of the dough to the foil-lined pan and press it evenly onto the bottom. Refrigerate pan for about 40 minutes. Topping: Add the remaining 1/4 cup of sugar and hazelnuts to leftover dough, and using your fingertips, work the sugar & nuts into the dough until becomes crumbly; set aside. Divide the oven, placing one rack second from the bottom, and the other second from the top. Heat the oven to 325 F.
Remove the pan from the refrigerator and prick the crust several times with a fork. [Chilling and pricking the dough will keep it from puffing up too much in the oven.] Place the pan on the lowest oven rack and bake the dough for about 15 minutes, just until the crust begins to set. Don't worry if the center still looks doughy, it's better to under-bake it at this stage. While the crust is baking, begin preparing the filling. In a large bowl, combine apples, jam, lemon zest, lemon juice, honey and sugar. Stir till well combined. Spread filling over warm partially-baked crust. Scatter remaining topping mixture over filling. Place the pan on the highest of the 2 racks and increase the temperature to 350F. Bake for 20-25 minutes, or until the crumb topping is golden. Remove the pan from the oven and place on a cooling rack. Cool for at least an hour before removing the bars from the pan (use the foil overhang to lift them out of the pan). Cut into square or triangles. Love e. e. cummings and this is a great quote for the New Year. Happy New Year! Beautiful bars! So delicious looking. Your photography is sooooo entrancing, always such an inspiration!! Happy New Year and thank you for sharing these mesmerizing talents with us!! Happy New Year to you! These look divine, I shall be trying them when our Southern hemisphere apples are ripe enough to eat and bake with. Happiest New Year! And thank you for sharing these gorgeous bars! Happy New Year, Valerie! Wishing you much happiness in 2015. This post is a delightful way to end 2014. Happy New Year to you too! 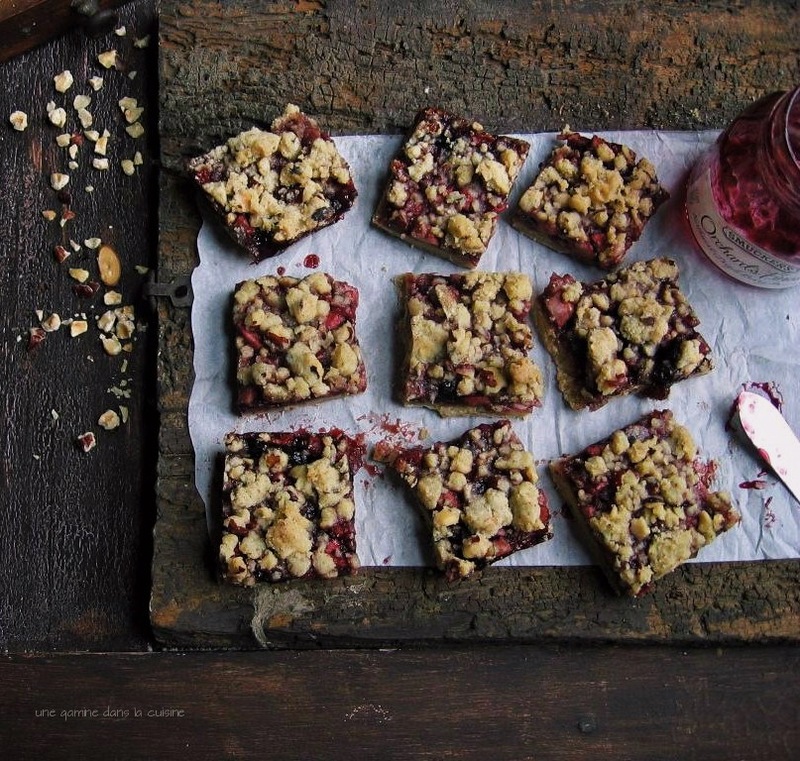 I am just loving everything about these streusel bars.. I definitely need to give the recipe a go. Happy New Year Valerie! I am such a sucker for a great bar cookie - these sound and look DIVINE! Pinning now! Messy and luscious sounds absolutely sinful. Cheers to a happy and successful New Year! Pinning these, because, yum! Oooh, the original 'Let It Go'! Your streusel bars look delightful. I need a bite right now, as it is -32C (-25 F) here in Toronto. Baby, it's cold outside! Gorgeous pics! I love hazelnuts. They are such a unique and flavorful addition to baked goods. A beautiful, little fruit bar. I hope your new year has been off to a good start. These look wonderful, I love the combination of hazelnut with sweet berries and tart lemon! I'm still here, my heart has not been up to blogging lately (the photography bit always draws a few snags that quickly turn into large, imaginary balls of tangled yarn). I do have a rather epic cake post in the works!! You are truly missed! I was afraid that I'd missed a subtle farewell in this post, Valerie. Glad to hear you'll be blogging again soon. Looking forward to that epic cake post. Hopefully the post will be up by this weekend. Are you sure, that this is photographed with snapshot budget camera? ?